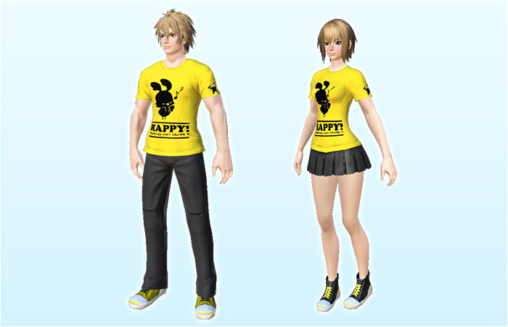 Beginning on June 18th, Shimamura stores all over Japan will begin selling a limited line of PSO2 themed t-shirts! Purchases of the clothing include a 16-digit code containing one of five different sets of in-game items. Anyway we could snag a shirt here in the West? The bases/codes aside.. the rappy and rare drop shirts are pretty cool looking. Got mine today, big disappointment, very likely many Japanese think so too. Atleast those i met there too were. 4. Only few and small sizes.. so even by Japanese (guys) way too small, for women ok, no LL at all, and about 2 L, so rest and most only M.
Theres a lot of commotion on fanart side too, for whatever reason. Atleast the quality is ok. And regarding Item code, the ingame shirt is just an Este-Ticket, so sadly not an exchangeable costume. So you have to choose wisely, especially when you got a ticket for women and use it on your male char, you can like you know, only use it on a female support partner..